Sample secretary interview questions that explore your personal traits, work competencies and motivation for the secretarial job. Expect questions that assess the behaviors required for successful performance in the secretary role. Be prepared for the range of typical interview questions asked in a secretary job interview. Use the answer help to develop your own excellent interview answers and get the secretarial position you want. What does motivate you will depend on your background and experience but try to make it relevant to what this position and company provides. Different motivators include challenge, increased responsibility, team involvement, interpersonal interaction, task complexity, learning opportunities and growth. What qualities do you consider the most important in a Secretarial or Administrative Professional job? Secretaries today are increasingly taking on the roles of information and communication managers. 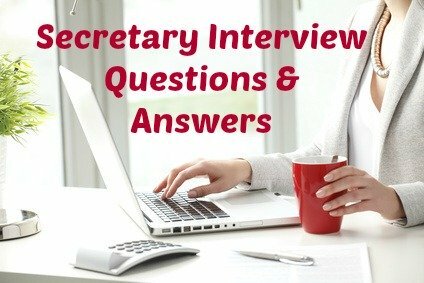 Secretary interview questions will explore key qualities that include planning and organizing ability, oral and written communication skills, initiative, confidentiality, adaptability, integrity, reliability, accuracy and attention to detail. Look at the key tasks of the position in the job posting and see which qualities would be essential for performing these tasks - for example if "scheduling" is a key activity then the secretary would need to be organized and able to plan and prioritize effectively. The job skills list can help you with this question. As a secretary, highlight your strengths and your weaknesses. Focus on three or four strengths that refer directly to the secretarial job requirements. Potential examples include organizing and planning, adaptability, information management, attention to detail, problem-solving, reliability, initiative , discretion, multi-tasking, prioritizing, good judgment and communication and interpersonal skills. Back up your answer with specific examples that demonstrates your strength in the work context. It is best to refer to one or two true weaknesses and then to detail the steps you have taken to try to overcome the weakness. What did you like best about your last secretary job and what did you enjoy least? The interviewer is trying to assess your fit with the job so try and make your answers relevant to the requirements of the position. Appropriate general answers about what you enjoyed can include meeting new challenges, dealing with diverse people, learning new skills, meeting daily and weekly goals. Your dislikes should not relate to the characteristics of the job you are interviewing for. Also avoid dislikes that relate to working conditions such as overtime, office environment and pay. Criticism of your manager or colleagues raises red flags about your interpersonal skills. Keep it general and rather refer to the absence of something in your previous job such as insufficient challenge or not enough work to keep you busy. View these secretarial interview questions that explore your secretarial skills and experience. Prepare your interview answers using the excellent answer guidelines. You can expect a number of behavioral interview questions in your secretary job interview. These are designed to explore the specific behaviors or competencies required for successful job performance in the secretarial role. Prepare for these type of secretary interview questions. Describe a situation in which you had to carefully schedule your activities to meet an objective. Tell me about a time that you were not satisfied with your work performance. What did you do about it? Describe what you do to control mistakes in your work. Describe a difficult problem you had to sort out in your last job. Tell me about a time a co-worker asked you about confidential information. How did you handle it? Maintaining confidentiality is a core requirement of the secretarial position. Your commitment to keeping sensitive information confidential and adhering to ethical standards will be explored in your interview. Prepare a list of good questions to ask in your interview. Asking the right questions shows that you have spent some time considering the position and the company and is a good indication of your interest in the job opportunity. Use the examples at interview questions to ask in your secretary interview to help you. Be ready when the interviewer asks "Do you have any questions?" The best way to land that secretary or administrative professional job is to prepare your interview answers to common secretary interview questions and practice delivering these in a confident manner.